Listen Rock 97.7 (CFGP-FM) live from Alberta. Wait as the stream loads. On November 2, 1937 the Active Rock FM stationed in northwest Alberta had a radio owned by Northern Broadcasting Corp. Ltd. The community radio station within the southern area of Peace River Country signed its first signals on air using 1200 kHz with radiated power of 100 watts. Bert Churchill was the first program director. In 1940, 1941, 1942, 1943 and 1944 the frequency and radiated power continuously changed with frequency shifting to 1350 kHz while transmitter were much powerful with 1000 watts. In 1994 Cecil Berry became the CFGP’s manager and the catch-phrase was “The Voice of the Mighty Peace”. 1945 also remained a year with a number of significant changes as CFGP joined the Trans-Canada Supplementary stations, moved to 1050 kHz and now the slogan was “The Alaska Highway Station”. In 1947 the CBC Trans-Canada affiliate which was at that time Taylor, Pearson & Carson Ltd (later Selkirk Communications Ltd.) invested in Northern Broadcasting however, the Rock 97.7 was operated under Northern Broadcasting. The clock was on its course, the commercial license was denied to Rock 97.7 FM in 1948, Art Balfour became the new manager, the approval of transfer of 46 common shares by CBC (1951), power increased to 5,000 W (1955) (later 10,000 W in 1957) and listeners increased to 39,651 in 1958. In 1962 CFGP came under CBC Radio network – a merger of The Dominion and Trans-Canada. In 1973 a move was made to transfer 50% of Northern Broadcasting shares to Selkirk Holding which already owning 50% of shares. In 1981 97.7 Rock left the CBC affiliation. In 1986 the AM dial was once again chosen by CFGP after the denial of FM license. In 1987 the Rock celebrated its 50th anniversary. On September 28, 1989 Selkirk Communications was purchased by Maclean-Hunter, thus transferring CFGP with a couple others to Rogers Broadcasting Ltd. On January 1996 CFGP got an approval to shift to FM band. The radiated power of the Rock was lessened to 66,000 W from 70,000 W; however retained its maximum power of 100,000 watts on April 23, 1997. On June 5 of the same year a new transmitter was installed in Peace River. The rebroadcaster meant for Peace River and worked on 104.3 MHz. In 2000 changes were made in the corporate structure of O.K. Radio Ltd. Now the ownership of shares following the implemented transaction was: Roger Charest 67.13% (Class A shares), François Charest 2.10%, Linda Charest 0.70% and Wind Mountain Holdings Ltd. 30.07%. On November 29, 2006 Rogers Broadcasting Ltd owned by Rogers Media Inc (eventually owned by Rogers Communications Inc.) was able to acquire the assets (CHDI-FM, CKER-FM, CKYX-FM, CJOK-FM and CFGP-FM) of O.K. Radio Group Ltd in Alberta. 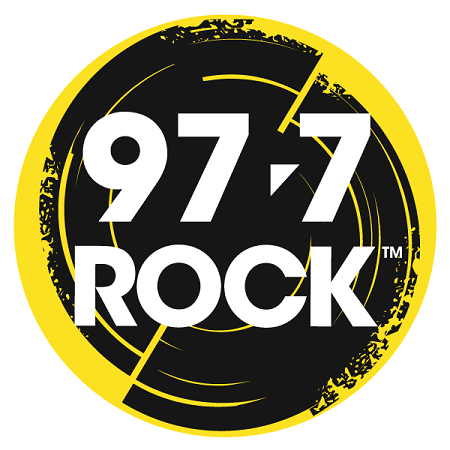 On January 16, 2007, the SUN FM was rebranded as Rock 97.7 and changed its slogan to “Today’s Best Rock and Killer Classics”. Middays with J.C. Coutts Shawna & J.C.